How did I get here again? Waking up here. Clocking out here. Frustrated again. I let down my guard again. I opened my heart again. What is wrong with me? Am I addicted to this dysfunction? Last year this time, I had a plan. I had deadlines. I went to counseling. I made a decision. I changed my routine. I created a budget. I deleted, blocked, and ignored. So why am I back here again? This cycle is unhealthy but I don't know how to get out. If you've ever tried to escape an unhealthy cycle with little to no success. this book is for you. 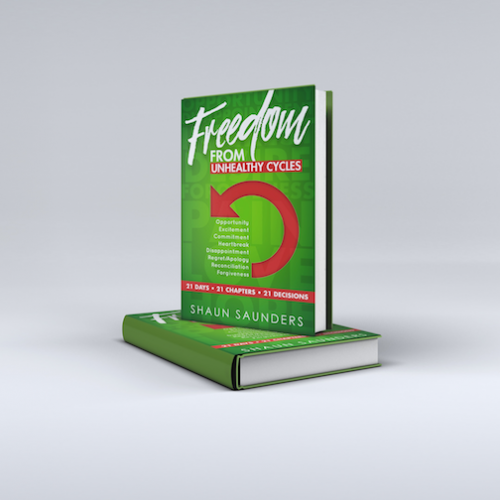 FREEDOM FROM UNHEALTHY CYCLES by Shaun Saunders is a 21 day accountability devotional written to help you create new habits, and permanent outcomes in your life. Once and for all, it's time to get FREE and STAY FREE!